Vinu kindly sent me a photo of an Arabian Toad-headed Agama that he took near Al Kharj and has allowed me to use on my website. The Arabian toad-headed agama Phrynocephalus arabicus, locally known as Sabahbah is also known as the chisel-teeth lizards due to the compressed, fused teeth being firmly attached to the upper jaw, unlike most other lizards which have loosely attached teeth. These lizards are also known as the chameleons of the Old World due to their striking ability to change their body colour. They typically have a wide, strong, flattened body, covered in rough skin with overlapping scales, and a long, flattened tail which is rounded at the base. 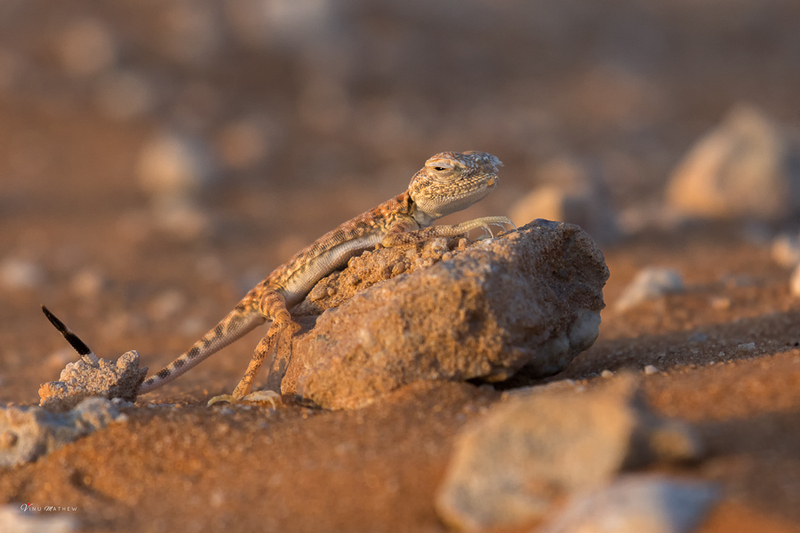 The Arabian toad-headed agama is a fairly small lizard that is highly adapted to life on loose sand. It has no external ear openings and fringes of long scales around the eyes keep out sand grains. The head is short and broad with a deep forehead and snub nose. It is highly variable in colour with various patterns of black, white and reddish markings, and it tends to match the colour of its background. As such, lizards found on pale coastal sands tend to be paler and less patterned than those lizards on red, inland sands. All variations, however, retain a black tip on the underside of the tail which, when raised, is used in visual signals. Scurrying across the sand, seeking out its insect prey, the Arabian toad-headed agama is active in all but the hottest hours of the day. During the hottest periods, it will stand high on extended legs to limit contact with the sand, balancing on fingertips and heels while using the tail as a prop. It may remain dormant during cold winter day. 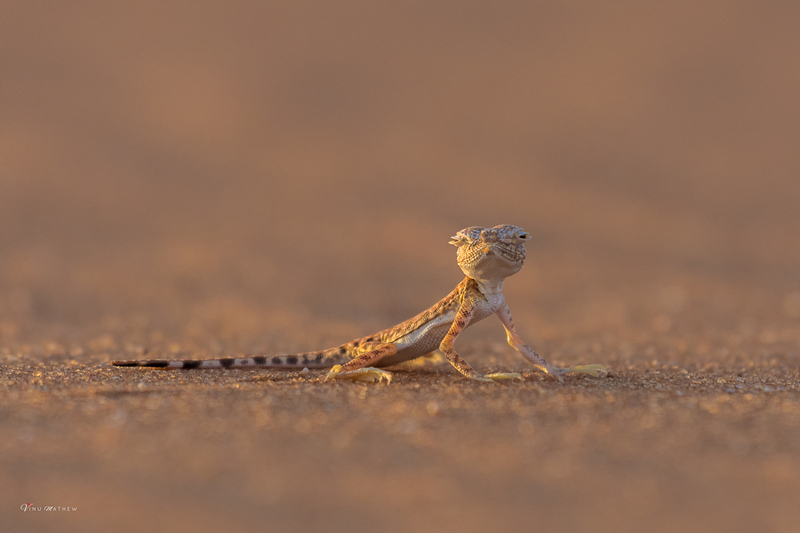 The Arabian toad-headed agama is able to sink rapidly into the sand by vibrating the body in a process called ‘shimmy burial’, and it uses this behaviour to escape from predators or create a nocturnal shelter. This species ranges from southeastern Jordan into the Arabian Peninsula, including much of Saudi Arabia, the United Arab Emirates, Oman (except the mountainous areas) and Iran (known only from the Mesopotamian Plain in the vicinity of Ahvaz). It is not known from Iraq. It occurs from sea level to around 1,000 m asl. They live in desert regions and are found in areas of soft, wind-blown sand but can also occur on harder and drier substrates with sparse vegetation. It is not found in rural agricultural areas.